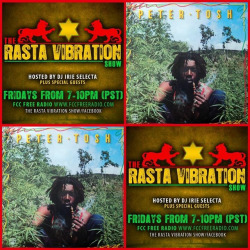 The Rasta Vibration Show coming in hot tonight!!! We have a bunch of new music to drop, Plus in our vinyl flashback series we’re playing Fred Locks album Black Star Liner & Sizzla’s Lp Taking Over! Tune inn worldwide 7-10pm on www.fccfreeradio.com Studio 1A!! !